All of us at Mark Moore Gallery are pleased to announce many new museum acquisitions from our artists in such a short time since the beginning of the year. The Santa Barbara Museum of Art has acquired Okay Mountain‘s 2011 video work, “Instructional Video,” but also, both the Orange County Museum of Art and the Museum of Contemporary Art San Diego have acquired the last two remaining edition copies of Okay Mountain’s 2010 video “Water Water Everywhere So Let’s All Have a Drink.” In addition, MCASD has also taken Allison Schulnik‘s 2009 animation “Forest” and her large oil painting titled “Captain,” that was featured in her last solo exhibition at Mark Moore Gallery in 2012. Allison Schulnik again has had work acquired by a museum this year with “Mound,” her most recent animation that premiered at her 2011 solo show at ZieherSmith in New York as well as being featured in her current exhibition at the Laguna Art Museum. The final edition copy of “Mound” has just been acquired by the Los Angeles County Museum of Art. Also in this short period of time, David Hilliard‘s “5 Cords” has been acquired by the Portland Art Museum, and Tim Bavington‘s “Cry You A Song” has gone to the Nora Eccles Harrison Museum of Art. All of this signals an exciting start to 2013 so far with many other museum acquisitions currently pending. Institutions such as the Wadsworth Atheneum Museum of Art, the McNay Art Museum, the Blanton Museum of Art, the Honolulu Museum of Art, and the Orange County Museum of Art are pending approval on works by Mark Moore Gallery artists Okay Mountain, Penelope Umbrico, Tim Bavington, and Cindy Wright. Tim Bavington‘s fifth solo exhibition – which also marked his tenth year of representation with Mark Moore Gallery – opened last Saturday night to the classic rock-inspired beats of DJ More Dillon and an array of long-standing enthusiasts. A selection of these photos also appear on our gallery page on Facebook – so don’t delay in “liking” us and tagging yourself in the album! Thanks to Will Tee Yang for the event coverage and general awesomeness. We can’t believe it’s already March, but apparently it is and we’re getting on a plane to go to New York on Monday for art fair week! PULSE New York is moving to a new location at 330 West Street, at the corner of the West Side Highway and West Houston Street. The new venue, a former New York Central Railroad freight train terminal housing five blocks of the original High Line, has 30-foot high ceilings with varying levels of lofted space to be used for special projects. 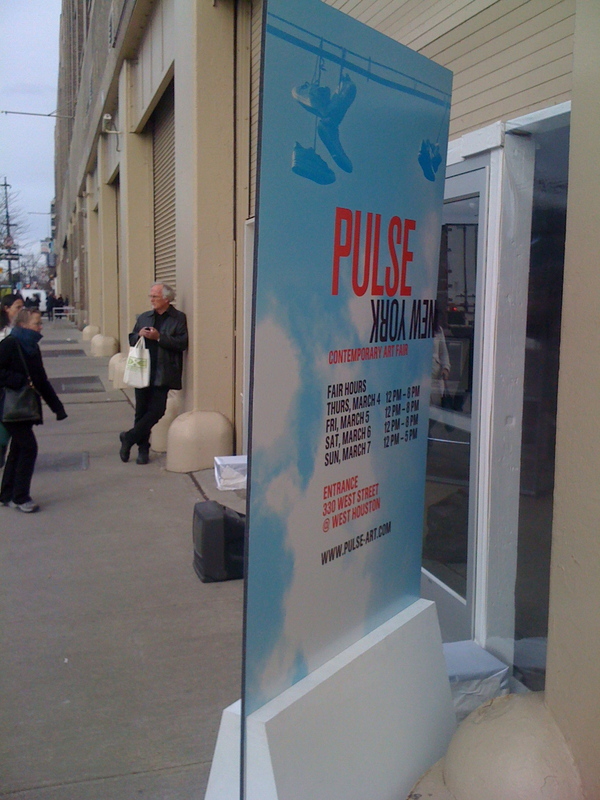 The fifth edition of PULSE New York will take place March 4 through 7, 2010. 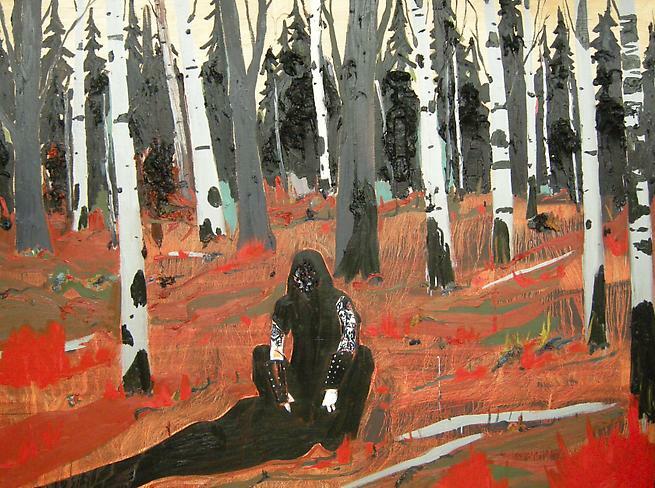 Mark Moore Gallery will be featuring a solo booth of new work by Canadian painter, Kim Dorland, in Booth A-16. These paintings have never been seen previously, are studio-fresh and created especially for MMG’s booth at PULSE NY. Additionally, artist Tim Bavington has been selected to create a special public installation near the entrance of the fair venue – complete with new works! To preview the Bavington and Dorland works going to PULSE, visit our art fair preview page. Additionally, you can keep abreast of all the fair activity by reading our Fair Reports here, or following our updates on Twitter and Facebook. Planning on heading to the fairs, or being in the New York area? Send us a message on Facebook or @-reply us on Twitter, and we’ll send you day passes! Scott White Contemporary Art will be mounting a group exhibition featuring MMG’s Tim Bavington, Gene Davis and Kenneth Noland this coming spring. Opening on March 12, 2010, and on view through May 8th, “Intervals” will showcase the three aforementioned artists’ use of rhythm and pattern through painting. Further information and details can be located on the gallery’s website.